Change the colour of the area above a frame by setting a scene marker. This will allow you to find the frame more rapidly when quickly scanning the Timeline. In the Timeline view, make sure the red playhead is set on the frame you want to mark. Even if you right-click on a different frame, the scene marker will be created on the current frame on which the playhead is positioned. Right-click in the frame counter area and select Scene Markers > Mark Current Frame. 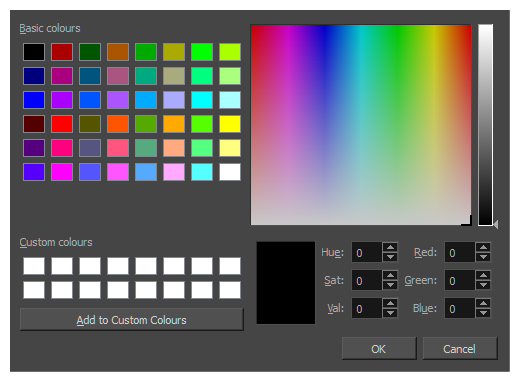 Click the Colour swatch to open the Marker Colour dialog box and select a colour for the scene marker. Click OK. In the Note field, enter descriptive or title text and click OK. 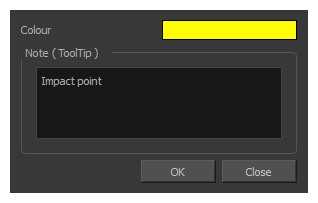 This text will appear in the tooltip when you hover your mouse over the scene marker. In the Timeline view, the scene marker is displayed at the current frame. Hover over the scene marker to display its tooltip.